Everyone knows that the best time to start investing for retirement is with your very first paycheck from your very first job. This allows you to take advantage of every year of savings, tax-deferred growth, compound interest, and matching contributions from employers that you’re eligible for and to build your retirement nest egg to its fullest potential. But what if you’re already in your mid-40s or early 50s and the chance at early investing has long since passed? Is it still possible to start investing for retirement later in life and still accumulate enough wealth to live out your golden years free from financial worry? The answer is yes—and here’s how to do it. You’ve lost enough time as it is, so the key now is to start immediately. 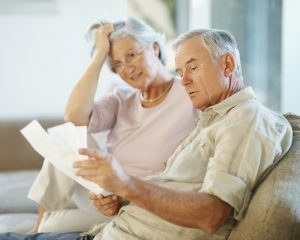 This means setting aside as much of your current income as you can for retirement, even if that requires you to make significant cuts elsewhere in your budget. At this point in the game, sticking with ultraconservative investments isn’t going to get you very far. You have to be willing to accept some risk with your investments to ensure your money earns a worthwhile return. Accepting risk doesn’t mean you should throw all caution to the wind and go for broke with your investments. Instead, protect yourself with common hedging strategies such as diversifying your portfolio and purchasing physical gold. Whether you’re paying into a tax-deferred gold IRA or a company sponsored retirement plan that offers employee matching, be sure to make the maximum allowable contribution every year. It’s hard to build your retirement savings when you have excessive credit card debt, a second mortgage, or other high-interest loans making claims on your cash, so try to pay off your bills as quickly as possible. This might also be a good time to look into downsizing your home, car, or other facets of your lifestyle to help secure a better future. Keep your investment plan flexible and allow yourself to make adjustments as needed. For example, if you find yourself a little short on funds one month, go ahead and invest the smaller amount rather than waiting to accumulate your goal amount or (even worse) skipping the investment altogether. Understand that you will inevitably encounter bumps in the road, so be willing to change things up until your finances get back on track. As a last-ditch resort, consider delaying retirement for as long as possible if you are in relatively good health. This will allow you to keep earning an income and allow you to collect a higher percentage of social security benefits so you have even more of a cushion when you finally do retire. Beginning to invest for retirement later in life isn’t ideal, but it is absolutely doable. Start now by checking out the precious metals IRA options available at American Bullion and by following the other tips and strategies listed above.